On Tarpat street, just before Kikar Hameginim, is the Sanz Synagogue. Originally built in the 1870's by Rabbi Yechezkel Halberstam, (the Shinever Rebbe), at the behest of his father, Rabbi Chaim of Sanz, it has been in continuous use ever since. Even during the recent 2006 war there was a daily minyan. During the second half of the 19th century there was a movement among Chassidim to settle Eretz Yisrael. Rabbi Chaim of Sanz, unable to travel himself, wanted his followers to do so and asked his eldest son to build a shul in Safed for this community. Rabbi Chaim thought that this would benefit his praying as he believed that all prayers needed to travel via Israel to reach heaven. 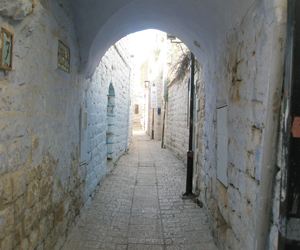 Around 100 Sanz Chassidim made the move to Safed, living, praying and working in the present Old City. Although numbers have gone up and down over the years, since that time there have always been Sanz Chassidim in Safed. At present, there are around 40 Sanz families, many of whom live in the modern apartment building opposite the shul. Over the years, despite various renovations, modernizations and extensions to the shul, the southern wall, which houses the Aron Kodesh, still remains from the original building. Most recently, a mini beit midrash was added to the side of the main shul called Heichal Zichron Yitzchak after a man who donated all his Shoah reparation money from Germany for the project. The Sanz synagogue is a shtibel or in modern terms a ‘minyan factory'. This means that for the weekday morning prayers of Shacharit there are minyans going on at least every half an hour, until approx 9 am or even 10am in the summer. The ‘factory' is therefore very convenient for vacationers who wish to pray later than the 6.30 or 7.00 am early morning prayers usually available in Safed. Upstairs, through a side door, is the ladies gallery. With glass windows so you can look down from the balcony on to the men below, it is very easy to see and hear what is going on. Used during the week by men for the ‘minyan factory' and as a beit midrash this upper section has its own Aron Kodesh, which gives it an added spiritual dimension, compared to many Ladies Galleries. There is a kollel, or married men's yeshiva every morning and afternoon, and all night on Thursdays, with between 20 to 40 men studying Torah throughout the year. Most members of the kollel are chassidim although not all identify with Sanz. Visitors are of course welcome to study in the beit midrash. As most Chassidim believe that men should go to the mikva every day, Sanz has its own mikva for men. It is equipped with showers and two mikvot, one heated and one at room temperature and costs 5shks, with a monthly ticket available. It is open every day in the mornings including Shabbat and all day on Fridays. The women's mikva is just around the corner on Beit Yosef street. Outside in front of the building there is a mikva for utensils, so that people can ‘toivil' (purify) their new kitchen appliances, dishes and utensils. Shabbat: 35mins after candle lighting.